The tooth is carefully evaluated so that the best material is selected to optimize functional and esthetic results. Front crowns often require custom shade matching procedures to achieve the best result. Crowns completely cover every visible part of the tooth -which is why they are sometimes referred to as “caps.” A part of your tooth remains but is essentially “rebuilt” to resemble the tooth at its exterior best. What is a Dental Crown (Cap)? Dental crowns (also referred to as dental caps) are tooth-shaped restorative coverings that are custom designed to fit over natural teeth. Crowns encircle the entire tooth and extend from the top of your tooth to your gum line, and they cover broken, chipped, or misshapen teeth. Once cemented in place, a dental crown will fully encase the visible portion of the treated tooth. A completed dental crown looks and feels like a natural tooth .A dental crown restores a tooth’s shape, size, and strength. Once it is permanently bonded in place, only a specialist should remove it. Using the latest advanced techniques and materials, Dr. Barry Kaplan, a Prosthodonitst in Morris County, can help you achieve the smile of your dreams with state-of-the-art dental crowns. At Advanced Prosthodontics and Implant dentistry in Morristown, NJ, Dr.Barry Kaplan takes the extra time and care to customize his crowns so that they will match each patients’ unique smile and bite and let you speak and chew comfortably while improving your appearance and self-confidence. Dr. Barry Kaplan’s seemlessly combines science and artistry to recreate natural aesthetics and assure you of attaining the optimum cosmetic result. 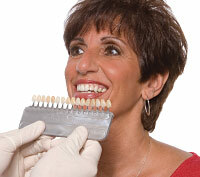 Dr. Barry Kaplans’ custom shade analysis ensures that restorations match with the shade of your existing teeth. Your crowns are created from a high quality dental materials using one of the finest labs. The porcelain is translucent and life like, like natural tooth enamel, and it resists stains, permanently. Anterior crowns are made from either porcelain or porcelain fused to a metal core. All-porcelain crowns are the most natural looking option because they subtly reflect light very similarly to a natural tooth, are translucent (also similar to natural teeth), and give a very natural, cosmetic result..
Natural front teeth often exhibit many different shades that vary from person to person. Our office uses shade matching to make restorations that perfectly match the color of your natural teeth. Our shade matching system is a computerized small hand-held device that allows us to view the tooth hue, value and chroma in different light settings to create precise color matches. With this technology, you can be confident that your restorations will beautifully match your natural teeth. While your crowns are being created, you will be given temporary crowns. 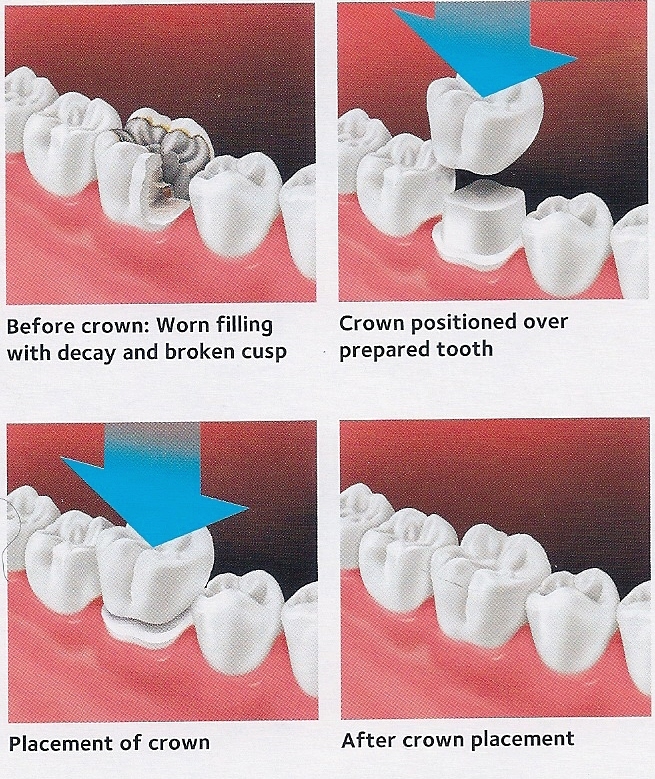 Crowns are cemented permanently to the tooth and after it is placed it can be cared for just like your natural teeth. Before the insertion of the Cosmetic crowns, it is imperative that they are able to seamlessly blend with your natural teeth. Choosing a Dr Barry Kaplan (Cosmetic Specialist) can be the difference between getting the smile you want and a serious disappointment. The tooth might be broken down due to decay or fracture. The crown serves to restore the original size, shape and contours of the original tooth. The tooth might have had a root canal treatment. Over time a tooth that has had root canal will become brittle (think: brittle branch that snaps easily). The crown fits over the tooth and completely encircles it (think strap around a barrel) to protect it from further damage. The tooth might be completely intact but misaligned. A crown can be placed over the tooth to make the tooth appear more in line with the adjacent teeth. The tooth might be completely intact but the color is off. A crown can be done to correct inconsistencies in the shade of a tooth to make it match better. Crowns can be made of various materials. In the past, most crowns were made with a metal substructure for strength and porcelain baked over that for cosmetics. The porcelain is matched to the existing shade of the adjacent teeth. Crowns in the front are often made with all ceramics There are many different types of ceramics that can be used and depending on the color and translucency of the teeth to be restored, an appropriate ceramic is chosen to best suit the needs of the patient. 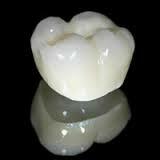 Zirconia is a newer ceramic being used today that is very durable. It can be used in front or back crowns. A crown can take as little as two visits (in some more complicated cases, it can take more). On the first visit the tooth is prepared for a crown. What this entails is reducing the tooth in all dimensions by 1-2 mm. An impression is made of the prepared tooth and a temporary crown placed on the tooth while the permanent crown is being fabricated. A shade is also taken as well as a bite registration in wax. The second visit is when the crown is finally cemented on the tooth.